As promised... A crock-pot soup! Sorry, I think it might be HUGE. 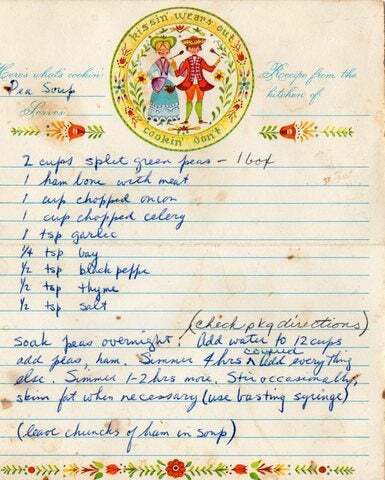 But, here's the deal, this is the one and only recipe my Dad ever cooked/wrote down/made. He wrote it down during graduate school in the early 70's and we make it to this day. My parent's didn't get a crock-pot until 1975, so in the early days they made this on the stove. It is simple and delicious and goes quite well with cheddar biscuits and a cold Smithwicks. My Dad's tightly scrawled handwriting still makes me giggle. He was this enormous dude with gigantic hands and his handwriting never changed, even in the end. You see, I am card-carrying member of the Dead Dad's Club. He passed away gracefully a year and half ago and there are still days I have to remind myself he is gone. And the oddest things remind me of him. There's the obvious, like Puck's version of No Surrender sent me to UglyCry mode; and then there's the strange, like realizing Paxson is still in the Head Office for the Bulls and I want to talk to him about that. We picked the best Bull in the 80's and WE WERE CORRECT! So, I share this recipe to honor him and to pass his spirit onward. Peace, Dad. I miss you.